Drones are everywhere today. Just 5 years ago they used to be only for the military, and cost millions. And now they are for hobbyists and even kids. Drones arrived in our lives and conquered the extreme ends of the market for technical goods. They proved to provide the best value for both, defense budgets and pocket money. Now the race is on to fill the gap in the middle: startups, corporates and analysts try to find the most promising commercial applications for drones. That is not an easy task since drones can be used for a surprising variety of tasks. Most discussed is the delivery of goods that Amazon, Google and DHL are planning. Others see the future for drones in surveillance, detecting fires, cracks in pipelines or illegal wood logging. They can also monitor farmland in detail for precision farming. Or communication: autonomous solar powered drones can be used to hover at high altitude over an area for months to provide wireless communication like a satellite. Facebook and Google bought startups in this field. But there are other disruptive uses for drone technology that are mostly overlooked in this debate. SpaceX – SpaceX’ “Rocket Drone”, just because it doesn’t look like a drone doesn’t mean it isn’t one. Take Elon Musk and his company SpaceX. 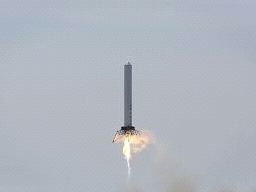 They are attempting to land and later reuse their Falcon rockets after they delivered the payload into space. For a pilot it is impossible to control a precision upright landing of a rocket that literally falls out of the sky. The most up to date drone technology is needed to make this work. If the rocket could indeed be landed and reused, this would lower the costs of one flight from the cost of building a rocket to the cost of refueling it. That means US$ 55 million vs. US$ 200,000 and a huge business potential for this “rocket drone”. Or take Miles Loyd. In the energy crises of the late 1970s, Miles Loyd worked as an engineer at Lawrence Livermore National Laboratory and thought about how to build the best wind generator imaginable. He had the radical idea to build it without a tower and to only use a flying wing connected to the ground by a tether, much like a kite. He calculated how much energy this “flying wind generator” could produce. Based on the formula he first established – now often called Loyd’s Formula – he found that a wing with the size, weight and aerodynamics of a standard plane wing of the 1970s could produce 6,7 MW of power. Even larger wings with an output of 45 MW looked feasible. To put this into perspective: even today, 35 years later, the average wind turbine is still below 3 MW and the largest existing prototype has 8 MW. Loyd obtained a patent and published an article on this new technology. He could not find investors to build his flying wind generator, because he had no solution for one problem: how to control such a flying wing without a pilot? Today, we have a technology that lets us control flying objects without a pilot. We call them drones. If we can apply this new technology to Loyd’s old formula we can build a new type of drone: the wind drone. How exactly does a wind drone work? Wind drones are a lot like kite surfers. Kite surfers use a kite and a tether to pull a surfer through the water. The same mechanism can be used to generate electricity. The tethered kite or wing is connected to a drum and a generator on the ground and the tether is wound around the drum. The wing pulls on the tether and turns the drum to generate electricity. Once the tether is fully unwound, the wing nosedives and the tether is quickly reeled in. Then the cycle starts again. This up-and-down motion led to the name of the “yo-yo” type wind drone. Google X, overseen by Sergey Brin, is working on a different wind drone via its project Makani. Google’s approach is to use little propellers (mini wind turbines) and generators directly mounted on the wing where they produce electricity. An electric cable is woven into the tether and transfers the electricity to the ground. In 2013 Makani presented a working prototype. They already built their first scaled up product with 600 kW output that is currently being tested. Google will be the first team that can show a wind drone with power outputs comparable to today’s wind turbines but it is not alone in having realized that drone technology is ripe to take on Loyd’s formula. Companies including 3M, ABB, Alstom, E.ON, Honeywell, Statkraft and Softbank have conducted research into wind drones or financed startups. Dozens of startups worldwide are working on wind drone prototypes and some are not far behind Google. Some of them use soft wings resembling a surf kite or a paraglider, others use hard wings like the wing of an airplane. The designs also differ in many other details and it is not clear which will become the dominant one. But whatever the final design, wind drones share three characteristics that make them contenders for being amongst the most promising drone applications: they will disrupt their market, they will be amongst the first autonomous drone application to be market ready and they will have the largest market of all drone applications. Producing wind energy is not a new idea and we already have a tried and trusted device for this task: the wind turbine. Wind drones will have to offer significant advantages over wind turbines to conquer this market. Airborne wind energy companies claim that their devices will cost less than half of what a wind turbine with the same power costs. In addition, they claim that wind drones will stay idle for less time during a year and will therefore produce up to double the amount of energy with the same rated power. If they were right, energy from wind drones would only cost one quarter of energy produced by wind turbines. But can we believe such claims? It is the structural elements, the tower, the blades, the foundation and the rotor hub that make up half of the total capital costs of wind turbines. These parts are so expensive because of the material required to build them. Up to 700 tons of steel for the tower and another 100 tons for the rotor hub, up to 100 tons of glass-fiber reinforced plastic for the blades, and up to 4000 tons of concrete for the foundation. It is exactly these massive structures that wind drones do not have. The tower is replaced by a thin tether. A wind drone with the power of the largest existing wind turbine (8 MW) requires a tether that is 2,5 inches/6 cm thick and would be weighing less than one ton. Only minimal foundations are required and the wings can be much lighter requiring only 1 to 10% of the material of the blades of a wind turbine. The Google Makani 600 kW wing weighs below 2 tons including the tether and generators on board. A comparable 600 kW wind turbine weighs between 50 and 100 tons without foundation. The components that wind drones do still need for power generation are cheap in comparison: the generator that produces the electricity is less than 3% of the total costs. Of course, wind drones will need more and better sensors, processors and other control components, but these cost much less than the saved materials. So how can a wind drone save half the costs of a wind turbine? It’s physics. A basic construction principle for every engineer is to avoid a 90° force on an unsupported lever arm wherever possible. Large bridges are therefore supported by arches, columns, or suspension tethers. If parts cannot be supported they have to be made as short as possible. Wind turbine engineers have done the opposite. Rightfully wanting to build ever larger and more efficient wind turbines they worked to increase the height of the towers and the length of the blades. Both are lever arms in a 90° angle to the wind force and they are not supported. Wind engineers would love to tether the tower and the blades. But it is not possible. The wind can blow from all directions, so the rotor has to be able to rotate around the tower and the blades have to spin freely. Wind engineers have nonetheless been so successful in building ever larger wind turbines that they now easily hold the world record for building the longest lever arms in all of engineering. But this didn’t help in saving material. The tether of a drone can be 1000 times lighter than the tower of a turbine simply because it avoids lever arms. One physical fact to cuts half the costs, other physical facts double the output for wind drones. Since wind drones are not restricted by lever arms they can fly higher, say at twice the height of normal wind towers. Then a second physical fact kicks in: on average the wind speed increases with altitude. And a third physical fact gives wind drones a nice bonus. The power contained in the wind not only increases linearly with the wind speed but it increases with the cube of the wind speed. So double wind speed increases wind power 8-fold (2³). These two physical facts combined lead to the simple fact that there are almost no bad wind locations for wind drones. Wind drones only know good and excellent wind sites. They will find enough wind at almost any site. The difference the height can make is shown by the wind data of Dresden (Germany). At altitudes that wind turbines can reach, it is a very poor wind location, which even under the generous German feed-in tariffs does not allow economic energy generation. 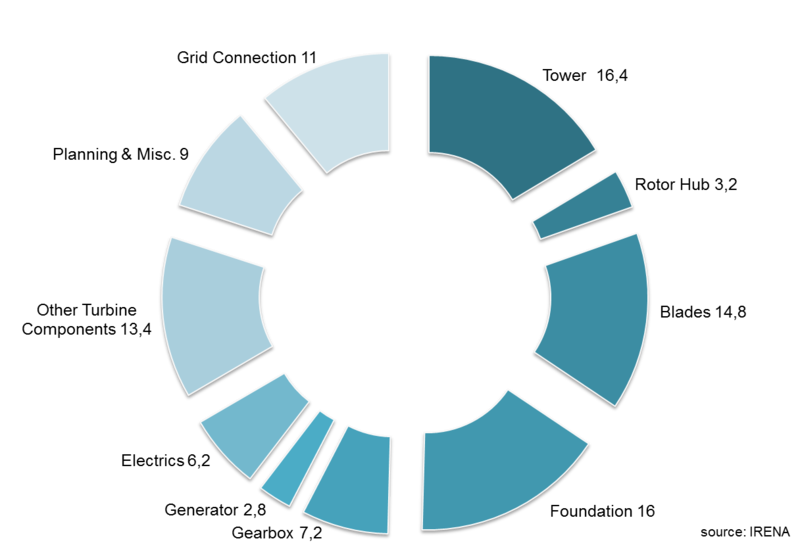 At wind drone altitude, the wind speed is increased by 60% (grey columns). This does not sound spectacular, but due to the cubed relationship between wind speed and power the available wind power almost quadruples (blue columns). At this high altitude Dresden becomes an extremely windy place at normal wind turbine height matched by only few places at the coast, in the mountains or offshore. The largest offshore wind park of the world, London Array, has a comparable average wind speed of 9,2 m/s at 100 m hub height. This is not surprising. Obstacles on land like forests, hills and buildings slow the wind down. One reason why offshore winds are often so strong is that there is nothing to slow them down. The same is true for high altitude winds: there is nothing to slow them down. 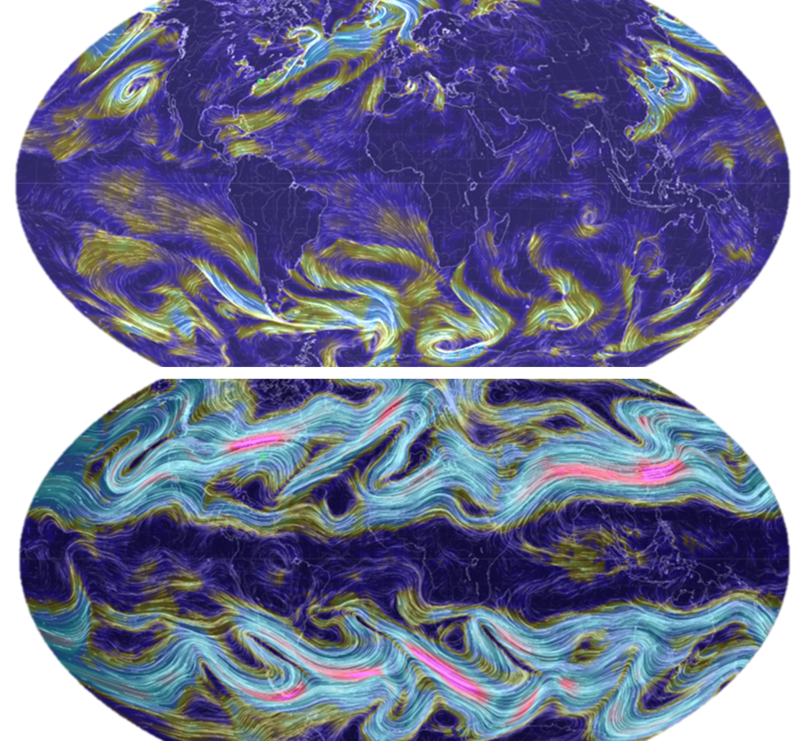 Also, winds offshore or at high altitude are typically not only stronger but more constant and are therefore a steadier and more reliable source of electricity. Offshore wind turbines work at full capacity more often and are idle for less time during a year. Their so-called capacity factor is therefore higher and makes them better suited to provide base load electricity. 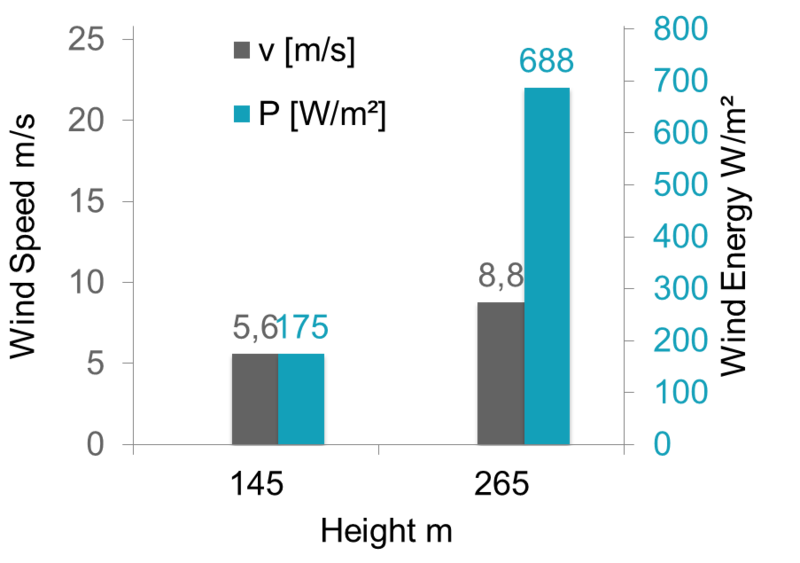 They produce about double the output of average onshore turbines with the same rated capacity. But since offshore wind turbines cost 2 to 3 times the amount of onshore turbines to build, this advantage is more than compensated. Offshore wind energy is still more costly than onshore wind. As research by the largest German utility E-ON shows, wind drones placed offshore can even further improve the high yield of offshore wind turbines by 50%. They work at full capacity at almost 70% of the time. So wind drones should be cheaper to build than wind turbines and are able to access much stronger high altitude winds so that wind drones will be producing at full capacity much more often than wind turbines. The result could well be what airborne wind energy startups claim: electricity for a quarter of the price of today’s wind energy. Google agrees that wind drones will make wind energy much cheaper. Google calculated that less than 16% of all the onshore US sites are suitable for economic wind energy production with wind turbines, this figure more than quadruples for their wind drone so that over 66% of all the US becomes viable. The first wind drone prototypes already work. But when will they be market ready? Soon. 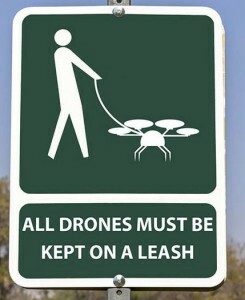 Sooner than many other autonomous drones. The reasons: simplicity, safety and the law. The concepts in real life: Google’s Makani flying wind turbine on the left, and a soft-kite yoyo configuration from German competitor Enerkite. The drum can be seen on the top of the truck. The flying is autonomous, the driving not. Various drones have various tasks which vary in difficulty. It helps that wind drones have quite an easy one. They fly the same simple pattern, say a circle, over the same space over and over and over again. Conventional wisdom has it that robots and drones will first get into the dull, dirty and dangerous jobs. Sorry, wind drones, we can’t get you dirty and dangerous, but when it comes to dullness it is hard to beat your job. Flying the same patterns over the same area means that the sensors know exactly what to expect, that the software has to know only a few flight patterns, and that the only variation can come from different weather, namely changes in wind speed and direction. And if the wind drone has to land for inspection or due to extreme weather, the landing site is also always nearby. No matter how simple a task, something can always go wrong and in case of flying objects the result can be a crash. To be a commercial success, every drone will have to prove that it is safe. Wind drones will at first only be installed in controlled areas in the countryside, or over the sea, where unauthorized access is not allowed. If the public cannot enter the flight area, the public cannot be harmed. This is the simplest recipe for safety. Amazon on the other hand might find it difficult to deliver its parcel to your doorstep while keeping safe distance from people. Wind drones also have a built-in safety feature that is unique amongst drones: They are kept constantly on the leash, pardon, tether. So even if all controls go crazy, they can only crash within the area of the tether and will not do any harm outside. Stationary operation and the strictly defined flight area of wind drones not only increases safety on the ground but also in the air. Wind drone parks can be included in air maps and turned into no-flight zones for low flying air traffic, just as wind parks are today. Air regulators have already honored the additional safety and special features of wind drones. A draft decree of the European airspace authority EASA has an exemption for wind drones (and other drones on the tether) allowing them to fly higher than other drones without the same restrictions. And under the new EASA “concept of drone operation” the degree of regulation will depend on a specific risk assessment for each use of drones. In case of operation in segregated areas, where drones do not pose a risk to the public, the operator might even approve its own risk assessment. Airspace regulators are currently working on regulation for drones worldwide. They will mostly use comparable flexible concepts. A regulator that simply applied today’s strict regulation standards for manned aviation to drones would choke off its national drone industry. So wind drones are not only safer in practice, but this additional safety in the air and on the ground will lead to much lighter regulations. This will make them much faster, easier and cheaper to build than other more hazardous and therefore stricter regulated free flying drones or aircraft. Buy an autonomous car today. It will fit your gear, too. What is true for drones is also true for autonomous cars. Many believe that autonomous cars will become commercial reality in a few years. This is not true. Fully autonomous cars have long ago hit the market. You can buy them since 2008. Where? At your local Caterpillar or Komatsu dealer, specialized in mining equipment. 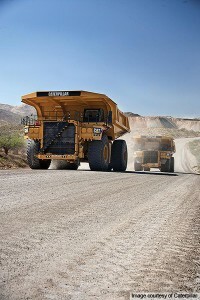 More and more mines are equipped with fully autonomous haul trucks, which transport the rocks and minerals within the mine. Are the engineers at Caterpillar and Komatsu that much smarter than their colleagues at Google, GM, Tesla, BMW, Volvo, Toyota, Audi, Mercedes and all the others combined that their product was market ready a decade earlier? Or could it be that this lead has to do with the fact that these haul trucks only have limited and well defined repetitive tasks? And that they operate stationary in mines, which are controlled distant places, where the public cannot be hurt, and where no or only limited regulation stopped the trucks from being quickly developed and used? Any lessons to draw for drones? The strongest argument for wind drones is their potential market: it is huge. Energy is big business. But wind energy is still tiny and accounts for less than 1% of total global energy use. This will change. And it is mostly a question of competitiveness. Onshore wind turbines are on the brink of becoming competitive with coal and natural gas. This so called grid-parity has been reached in the first regions, which means that wind energy is already the cheapest source of electricity even without any subsidies. Now enter wind drones with the potential to slash these costs to one quarter, with steadier production and with the ability to be deployed almost anywhere. This means that wind drones cannot only compete with wind turbines in their niche but will become the cheapest source of electricity. Cheaper than coal, gas, nuclear and hydro. And since today everybody is developing electric cars, the electricity produced by wind drones will be able to play in the major league of energy and to compete with oil as a transportation fuel. And oil will have a hard time competing. Even at the current “cheap” oil prices. Taking into account the inefficiencies of the combustion engine, oil at US$ 60 per barrel is still a more expensive source of power for a car than the electricity produced by today’s wind turbines. Based on the analysis above, oil would have to sell at a quarter of that price, below 15 US$ per barrel to compete with wind drone energy on a pure cost of fuel basis. The digital revolution has disrupted many markets, created vast riches and young billionaires. But we have to keep in mind that the digital revolution so far only took place in very limited markets. The digital so-called giants Google and Facebook – and many others – are all competing for a share of the online advertising market. This market has a total global volume of USD 150 billion. 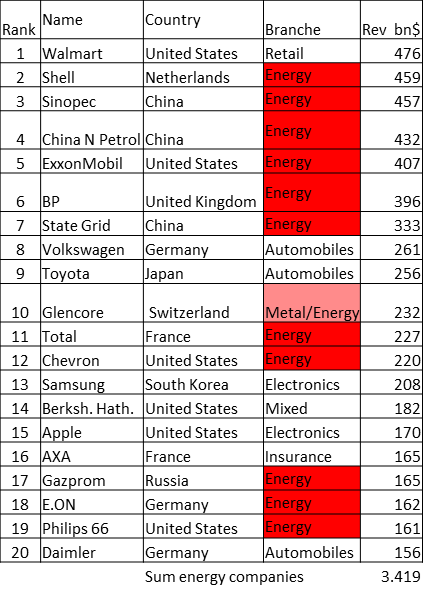 Compare this to the 3,4 trillion US$ revenue that the 11 energy companies on the list share amongst them. Or compare it to the total global energy market that is assumed to have a size of 6 to 10 trillion US$. We talk about a difference in market size that is close to a factor of 100. We cannot imagine what it will look like when the digital revolution finally arrives at the largest market of the world, the energy market. We have seen how the laws of physics together with the sensors, chips and smart algorithms of drone technology can replace the tons of steel and concrete wind turbines are made of. This can make wind drone power cheaper than electricity from fossil fuels. Their ability to harvest stronger winds higher up in the air gives wind drones the potential to provide power where it is needed, whether or not this place has a great wind resource. Cheap electricity made by wind drones could even provide the basis for the clean synthetic fuels of the future. And this fuel could be cheaper than oil today. Not having enough wind will not be a problem for doing all of the above. We have seen the dramatic increase of the wind resource by roughly doubling the altitude. But this is only the first humble hop of wind drones into the air. Once these altitudes are mastered, it will be tempting to try to go higher and higher, until we reach the jet stream at 10 km/33,000 ft. Lots of technical and legal problems will have to be solved to get there. But it will be attempted. The wind resource up there is way too good not to try. The median energy density over New York at this height is more than 10 kW/m² of which about 5 kW/m² can be used. The total energy consumption per person in the US is 10,5 kW. This includes all electricity use, heating, car and aviation fuels, and even the energy used for manufacturing. This means that harvesting wind in an area of 2 m² (22 sq ft) per person, the size of an open front door, could on average provide all our energy. If 10 wind turbines with today’s dimensions could be installed in that altitude over New York, they would have the same power as an average nuclear power plant, over 1 GW. High-altitude wind energy is not only an extremely concentrated source of energy, it also abundant. It can provide about 100 times the total energy we consume today worldwide. High altitude wind energy could allow us to turn green without the need to reduce our use of energy. For the energy sector this could mean nothing less than the end of the conflict between economy and ecology. Burning fossil fuels started the industrial revolution. The advances of mankind in the last 200 years were only possible with their help. Fossil fuels are needed to feed the 8 billion people that live on the earth today. But burning fossil fuels also lead to the destruction and pollution of nature, the poisoning of our cities and homes and to an ever more dangerous change of the climate of our planet. Our reliance on fossil fuels also led to unjustified wealth and power for those who possess them, to wars over their control and to undemocratic regimes in many countries. When we began to burn fossil fuels mankind made a huge leap forward. When we stop burning fossil fuels, we will make another big step towards a better world. Drones will help to bring this day much closer than most of us believe today.